The Rumpke Sanitary Landfill is located in Colerain Township, Ohio, and has been in operation since 1950. 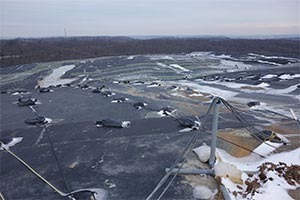 The site, situated north of Cincinnati, is one of the largest landfills in the United States. 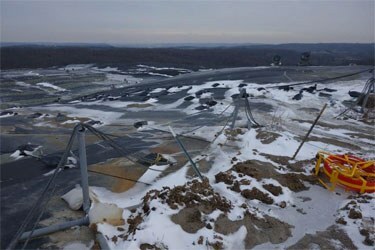 Rumpke landfill occupies over 230 acres and receives 2 million tons of household and industrial wastes annually. The landfill site also houses three methane gas recovery facilities which are owned by Montauk Energy Capital. The first plant opened in 1986, the second in 1995, and the third in 2007. The recovery facilities collect the methane gas from the landfill and convert it into natural gas which is then distributed by Duke Energy Co. This collection facility is the largest of its kind in the world. The Rumpke site, in August 2009, reported elevated temperatures and poor gas quality at some of these methane recovery wells located in a specific area of the landfill. The increased rate of oxidation within the affected area of the site, also increased the reported odor complaints from the surrounding communities. These complaints rose from 121 in 2009, to 437 in 2010, and the number of individual complains rose from 28 to 266. In a concerted effort to solve the issue, the Rumpke facility began working with the Ohio Environmental Protection Agency to evaluate possible solutions. 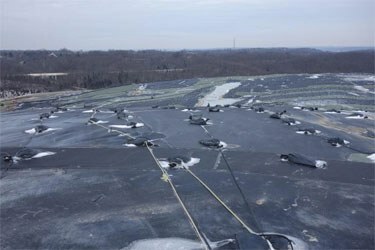 The first of these solutions was to install another layer 60 mil HPDE of geomembrane over the affected area in an effort to seal off the venting gases contributing to the odors. While this solution worked initially, only a few months passed before the recorded gas permeation increased back to the original volumes before installation. It was theorized that the gases created pathways for permeation, and once opened, these pathways never completely went away. To the contrary, they increasingly became worse based on site recorded data and complaint records. The next solution was the use of a deodorizer spray on the site to mask the emitting gases. In order to use this solution, Rumpke had to first gain approval via permitting from OEPA. This solution was very costly to implement and required a constant influx of deodorizer. The volume of spray being used also had to be permitted anytime changes were needed to fine tune the system. After multiple iterations of products, testing, and analysis, a better long-term solution had to be found. After hearing about the Absolute Barrier system, the site’s engineering manager decided to try the X60 geomembrane. A small patch of the liner would be placed over the hot zone for a worst case analysis. Immediately the detected odors from the newly lined area became nonexistent. The only odors detected emanated from the areas without the X60 cap. Since this initial installation, many more areas have been capped with the Absolute Barrier X60, and long-term site test indicate no gas permeation through the system. Area with Absolute Barrier® X60 geomembrane cap installed, photo 1. Area with Absolute Barrier® X60 geomembrane cap installed, photo 2. Area with Absolute Barrier® X60 geomembrane cap installed, photo 3. Area with Absolute Barrier® X60 geomembrane cap installed, photo 4. Installation of Absolute Barrier X60.